Home Latest US News Why were these men wearing pearls at a gun control hearing? State conservatives, however, say the lawmakers were supporting women’s rights to arm themselves for defense. Shannon Watts, the founder of Moms Demand Action for Gun Sense in America, a gun control advocacy group that has pushed state legislatures to pass tougher gun laws, accused the lawmakers of “mocking” her group’s cause. The lawmakers also were condemned on Twitter by Democratic US Sens. Cory Booker of New Jersey and Kamala Harris of California, who said the New Hampshire lawmakers were mocking the mothers. But the president of the Women’s Defense League, a New Hampshire gun rights group that focuses on “training and educating women” on practical self-defense skills, disputed the accusation, saying the pearls were worn in support of their group. “These men are supporting women and supporting women who support actual women’s rights. They are the farthest thing from sexist and there was a women lawmaker wearing them, too. That was conveniently left out,” Kimberly Morin, the president of the Women’s Defense League, told CNN Wednesday. Morin told CNN that her group has been wearing “pearls every hearing, every event,” for years as a symbol for their cause, and have recently dubbed them “freedom beads.” She said two of the group’s board members were handing them out at Tuesday’s hearing. Watts said she was unaware the group has used white pearls as a symbol but was steadfast in her belief that they were offensive. 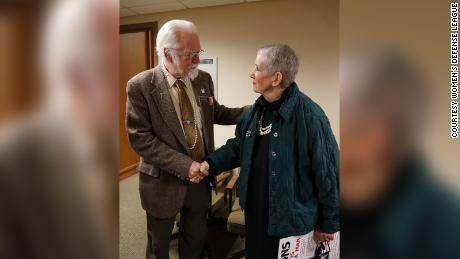 “These lawmakers were wearing (pins of) semiautomatic rifles on their lapels as well as pearl necklaces, which they know to be symbols of opposition to Moms Demand Action,” Watts said. CNN has reached out to all eight of the Republican lawmakers on the Committee on Criminal Justice and Public Safety that held Tuesday’s hearing. One of the Republican lawmakers, Rep. John Burt, told CNN that the “only reason” the pearls were worn was in support of the Women’s Defense League. He owns a set of pearls, which he didn’t wear at Tuesday’s hearing, but said he would’ve worn them had he known other Republicans were doing so. “For this out-of-state paid lobbyist lady — for her to come into our state and grab something that is good about those pearls and twist it … she should be ashamed and I hope she apologizes,” Burt said, referring to Watts, who has claimed she’s a volunteer. A group photo posted in the NH Journal and shared by New Hampshire House Republicans showed Rep. Jody McNally, the sole GOP woman on the committee, wearing a string of pearls, alongside Burt and a few of their colleagues. McNally did not return a CNN request for comment. The bill is viewed as likely to pass the New Hampshire House, which is controlled by Democrats. CNN’s Paul Murphy contributed to this report.